First time cardholders can earn up to 30,000 bonus points when they sign up for one of Chase’s Ink Business Cards. 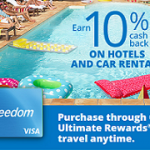 Under this offer, you’ll earn 20,000 bonus points upon first use of the card and an additional 10,000 points when you spend $5,000 in the first 3 months. 30,000 bonus points can be redeemed for $300 in cash.